This review kicks off a new series from me of reviews of games you can find on itch.io, an awesome site for games off the beaten path. The Terror Aboard the Speedwell is an amazing Twine game by Javy Gwaltney, one of the creators of You Were Made for Loneliness. Twine is an open-source tool for creating text-based games. You can do a lot with this tool, and I encourage anyone and everyone to give it a try – I’m going to soon! This is a sci-fi horror game, in the vein of Alien and The Thing (which happen to be two of my favorite movies). It features fifty thousand words, sixty endings, and a choice between two protagonists, both of whom are women! The science officer and the doctor aboard the Speedwell are also women. Being a big sci-fi and horror geek, I was immediately drawn into the story. I’ve played quite a few Twine games, but nothing that’s really felt like this; I had a lot of choices, and multiple playthroughs are absolutely an option here. Twine games tend to tell a linear, personal story, but this one is more like a choose-your-own adventure. I also felt like I could characterize Julia (the main character I chose first) in a way that I wanted. Dialogue feels authentic, and the tension and fear the story invoked were genuine. There’s also humor, and a little bit of fourth-wall poking, which I appreciated as a tension-breaker. This game worked for me on a lot of the levels that The Thing and Alien do – immediate caring about the characters, followed by enormous and inescapable tension. There were so many times where I instantly regretted the choice I made, but part of the fun of games like this (think The Walking Dead and Fables from Telltale) is that what you choose makes the game yours. No one will have exactly the same experience as you. There were a couple times where a choice I would have liked to make wasn’t there, or didn’t go with the character I was trying to be, but that’s understandable for a game of this nature, especially when the plot needs to be directed. There are also few typos here and there, but I was so into the story that it didn’t matter, and I’m sure they’ll be fixed with further updates/revisions. My first playthrough took about forty-five minutes, but there’s so many choices to explore that I know I’ll be getting a lot of mileage out of it. The cover art was done by Elizabeth Simins, who you might know from her Kotaku comics or her design of the Gaming’s Feminist Illuminati t-shirts. Your enjoyment of this game will depend on how much reading you like to do, but I absolutely recommend it to anyone who loves science fiction, horror, and wonderful genre storytelling. You can get the game here for a mere $2.50 and follow Javy on Twitter. You can find Elizabeth on Twitter, her blog, and her website. At the time of writing, all eight free DLC games have been unlocked and are on a release schedule. These will explore the backgrounds of each character in the game, and will be available to everyone who purchases the game. I can’t wait to check them out! 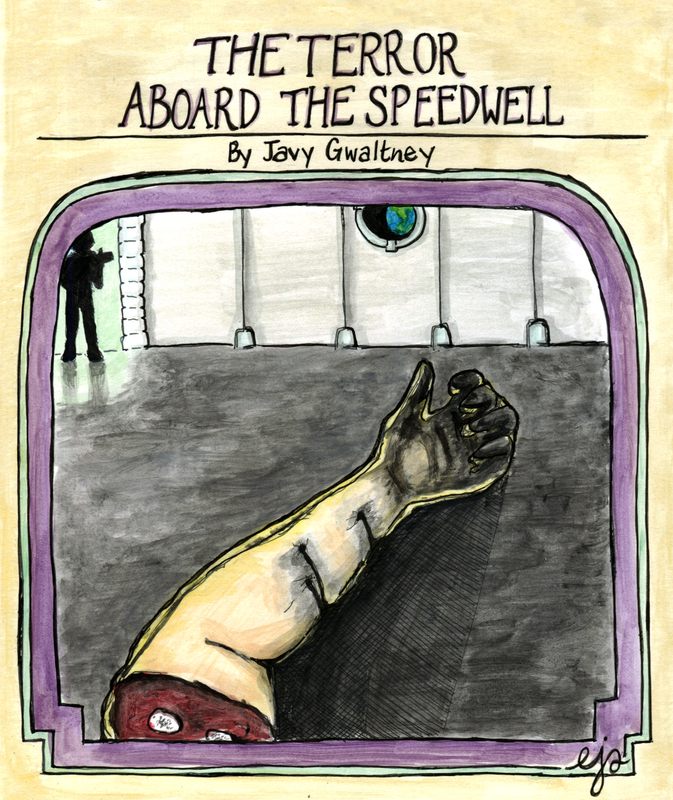 Content Warning: “Suicide, PTSD, and cannibalism are themes explored in The Terror Aboard The Speedwell. Violence, gore, and strong language are also part of the game.” Also, eye trauma.